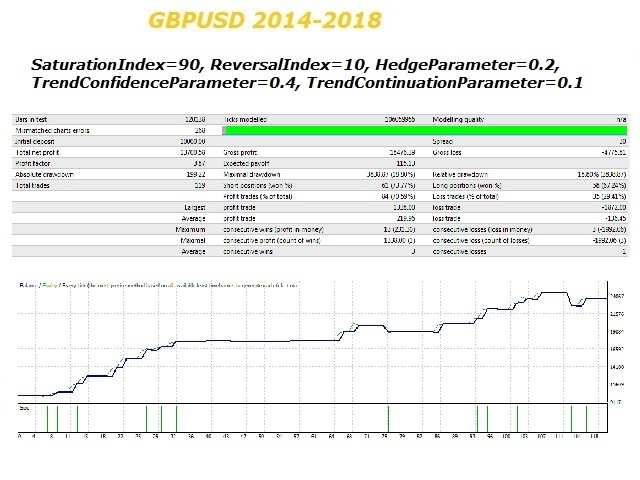 The Predator is a trading robot that uses a combination of various custom indicators designed to characterize trends. The Predator uses 2 take profit and stop loss levels. 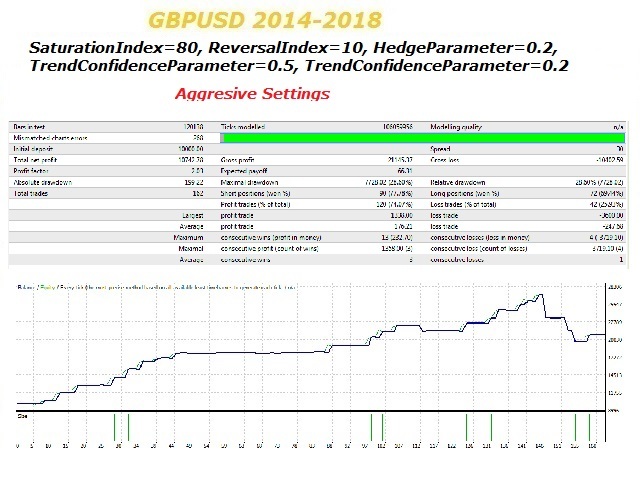 The Predator continually monitors the market after an order and will seek to close the order at MinimumTakeProfit under imminent unfavorable conditions otherwise it maintains the position until MaximumTakeProfit is attained. When the price moves past the minimum stop loss level a second compensating order is opened. 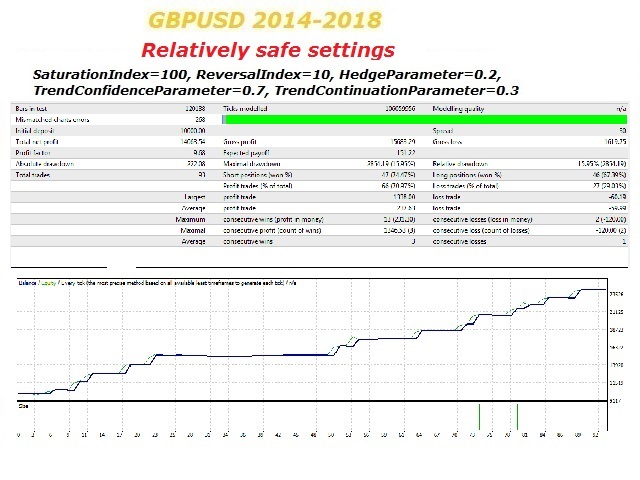 The Predator was adapted for the GBPUSD chart but in principle can be optimized for use on any symbol chart. This parameter controls the size of the compensating trade in the trend model. This factor increases the Lots to compensate for an existing trade. Ideally this parameter should be set to a high value, above 10. This is the level at which The Predator will close if no adverse market conditions are encountered. The Predator will try to close at this level when it encounters adverse market conditions. If adverse market conditions are encountered and minimum stop loss level is passed, then The Predator will open the compensating order. This is the period used to in the envelope indicator. Trend parameter. Recommended values are between 50 and 200. Trend parameter. Recommended values are between 5 and 80. Used to characterize the market condition for engaging a compensating order. Recommended values are between 0.1 and 1.0. Medium probability trend parameter. Recommended values are between 0.3 and 1.0. Medium probability trend parameter. Recommend values are between 0.05 and 0.5. (VERY VERY IMPORTANT!!) MAKE SURE THAT UseMultipleFrames is set to Yes. (VERY VERY IMPORTANT!!) The Predator depends indispensably on the ability to hedge. Use only brokers that allow hedging. Set this parameter to Yes in order for The Predator to employ hedging in its trades. The parameter UseMultipleFrames must be set to Yes(Very Strongly Recommended). Account that allows hedging. (Very Very Strongly Recommended). MaximumTakeProfit The maximum take profit in points. MinimumTakeProfit The minimum take profit in points. MaximumTrailingStop The maximum trailing stop loss in points. MininumTrailingStop The minimum trailing stop loss in points. EnvelopePeriodParameter Period of the envelope indicator. SaturationIndex Parameter for the trend model. ReversalIndex Parameter for the trend model. HedgeParameter Parameter connected to the trend model that sets hedging criteria. TrendConfidenceParameter Parameter connected to the trend model. TrendContinuationParameter Parameter connected to the trend model. UseMultipleFrames Use multiple frames in computations(Strongly Recommended to use multiple frames). HedgingAllowed Set to Yes if Broker allows hedging(Account that allows hedging is Strongly Recommended). Corrected some minor mistakes. Magic Number as input.